Swinging Gate Gate: Malzahn addressed Anthony Swain’s injury Tuesday. Photo: Todd Van Emst. In his Tuesday press conference, Gus Malzahn brought it up right out of the swinging gate. But the cameras did. Really well. Swain collapsed to the field seemingly for no reason with two seconds left in the third quarter of Auburn’s win over Arkansas. ESPN broadcasters were convinced Swain was faking the injury presumably to slow Arkansas down after the Razorbacks made a first down with the same “Swinging Gate” formation Auburn has run several times this year. Arkansas coach Bret Bielema made headlines last week by kinda sorta hinting that Auburn had maybe possibly intentionally edited out footage of the formation from the game film sent Arkansas. 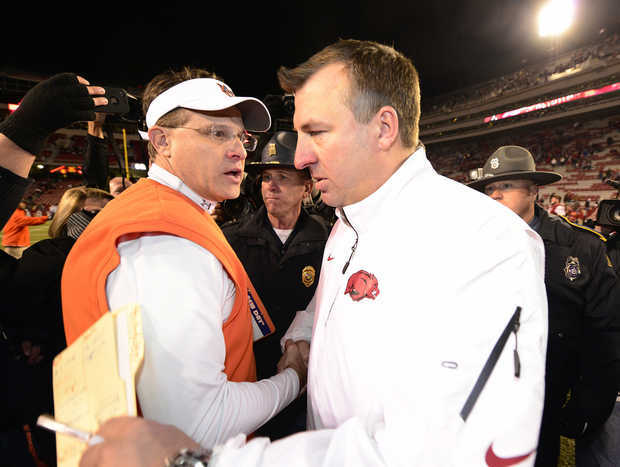 Earlier this year, Bielema claimed hurry-up offenses like Auburn’s were endangering the lives of young Americans. Malzahn thought he was joking. The real concern related to the hurry-up offense, he said, should be players faking injuries to slow it down. So, sure, some saw Swain’s swoon as spite. The word “gamesmanship” was used a lot. Totally understandable, Malzahn said. Related: It’s like talking to a beautiful woman—a phone call with Gus Malzahn. Your alliteration there was superb! Um, I mean, Alleluia! Alliteration always affords an amiable attitude.